The first thing to look at is the bandsaw blade itself as a dull or dirty blade is often the culprit when it comes to scorched wood. Ensure that the blade is sharp and clean as a dull blade will make it difficult to cut quickly and the slower the feed rate of the saw, the more friction against the wood being passed through it, increasing the likelihood of burn marks. Sometimes it may just be dirt such as grit, sawdust or oil which is causing the problem. If resins build up behind the teeth of the blade the cutting speed will slow, again increasing the chances of scorched wood. 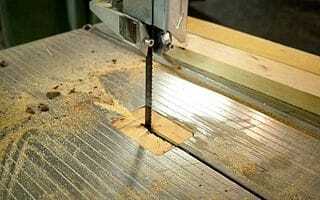 The feed speeds may be incorrect for the type of wood you’re cutting. Soft woods are more susceptible to burning and will need to be fed much fasterin order to prevent scorching. Here at Hardwood Mills, we’re happy to give our customers advice on the best feed speed for different types of wood however experience will ultimately teach you the ideal feed speeds for different types of wood and thicknesses of stock. Slow feed speeds can create beautiful smooth cuts however going too slow can burn the stock, so it will take practice to find the perfect speed which isn’t too fast or too slow. If the saw blade and guide fence aren’t perfectly aligned, the wood has a habit of pushing sideways against the fence as it’s fed through, creating inevitable pressure and friction on the wood itself. The best way to avoid this happening is to measure between the blade and the fence at both the front and back of the blade and if the measurements aren’t exactly the same, check your saw use-and-care manual and adjust the blade alignment so it is correct. If you do have burnt cuts of wood which you must rid of the scorch marks, try sanding them out or carefully using a wood plane or sharp scraper on them. Checking the sharpness of the blade and the guide fence alignment before starting to cut the wood and being careful with the feed speed will greatly minimise the risk of scorched stock. 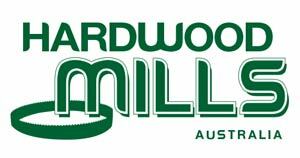 Here at Hardwood Mills we are one of Australia’s leading suppliers of bandsaws, bandsaw sharpeners and all accessories associated with bandsaws. Give us a call or drop us an email today to speak to a friendly bandsaw expert who will be able to advise on the best products on the market for your individual bandsaw needs! Hardwood Mills Australia offer machines and accessories that will cut any Australian hardwood timbers, as well as exotic timbers.